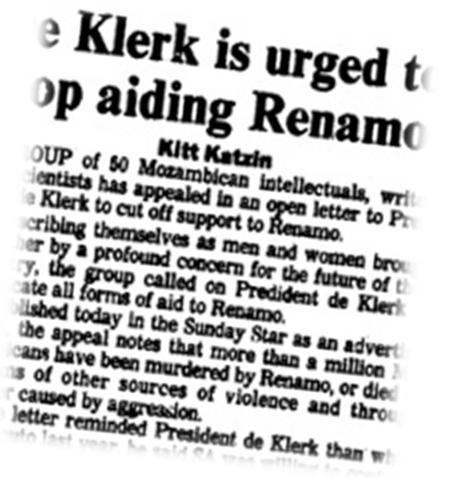 As the various possible peace process(es) dragged on, public patience was wearing thin, and on 14 January 1990, two open letters signed by a group of Mozambican intellectuals were published in the South African newspaper The Sunday Star in English, as well as in Domingo in Maputo, in Portuguese. 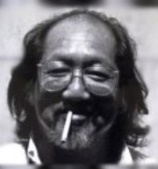 The signatories included literary figures, journalists, academics, film-makers, photographers, and musicians. One letter, addressed to the South African state president, appealed to him to cut off aid to Renamo, noting that over a million Mozambicans had perished in the ongoing conflict. The second letter, addressed to the South African anti-apartheid movement, referred to acts of destabilisation aimed at Mozambique. Above: Among the list of distinguished Mozambican public figures who signed the open letters in January 1990 were, from left to right, the musician Alexandre Langa, the investigative journalist Carlos Cardoso (1951-2000), assassinated in November 2000, the poet José Craveirinha (1922-2003) and the photographer Kok Nam (1939-2012). There are some differences in the list of the names of the signatories, as published in the two newspapers (e.g. António Muchave appears in the Sunday Star as Armando Muchave, Gil Laurenciano is spelled Gil Lauciano, Gilberto Mendes does not appear, and so on). The signatories as listed by Domingo were: Abílio Mondlane, Albino Magaia, Alfredo Mueche, Alfredo Tembe, Alexandre Langa, Alexandre Luís, Antipas Mate, António Muchave, Armando Arthur, Arnaldo Henrique, Bartolomeu Tomé, Calane da Silva, Camilo de Sousa, Carlos Cardoso, Clara Soeiro, Daniel Macaringue, Eduardo Maciel, Eduardo White, Eugénio Aldasse, Fernando Lima, Fernando Gonçalves, Fernando Manuel, Fernando Rosa, Filimone Meigos, Firmino Mucavele, Gil Laurenciano, Gilberto Mendes, Gustavo Mavie, Heliodoro Baptista, Isabel Noronha, Jaime Macamo, João Costa, João Manja, João de Sousa, Jorge Barros, Jorge Matine, José Cabral, José Cardoso, José Craveirinha, José Mucavele, José Rodrigues Pereira, José Júlio Tomás, Júlio Bicá, Júlio Macaringue, Kok Nam, Luís Lemos, Machado da Graça, Malangatana Ngwenya, Manuela Soares, Marcelino Alves, Margarida Manja, Mário Souto, Mia Couto, Moisés Mabunda, Naíta Ussene, Noémia de Sousa, Orlando Mendes, Paulo Sérgio, Pedro Chissano, Pedro Mucavele, Ricardo Rangel, Ricardo Santos, Roberto Uaene, Romualdo, Salomão Moyana, Sérgio Tique, Shikani, Suleiman Cassamo, Telma Faria, Tomás Vieira Mário, and Ungulani ba ka Khosa. Peace talks come closer. Mozambiquefile [Maputo] (January 1990), p.8-9. In English. Click here to download a PDF file, size 182 kb. Includes a report on a document about pluralism produced by the Frelimo Central Committee . Em Moçambique, não há impasse no processo de paz, declara ministro dos NE. Diário de Moçambique [Beira] (3 January 1990). In Portuguese. Click here to download a PDF file, size 164 kb. Remarks by Foreign Minister Pascoal Mocumbi. Joaquim Chissano. Estamos prontos para dialogar com os cabecilhas dos bandidos armados: Presidente Chissano na mensagem do fim-do-ano. Tempo [Maputo] (7 January 1990), p.2-5. In Portuguese. Click here to download a PDF file, size 516 kb. Frelimo disposta ao diálogo directo com a Renamo, diz Ministro de Negócios Estrangeiros. Século de Joanesburgo [Johannesburg] (8 January 1990). In Portuguese. Click here to download a PDF file, size 65 kb. [Short news item]. Africa Economic Digest [London] (8 January 1990). In English. Click here to download a PDF file, size 18 kb. Repeats an ANGOP item dated 21 December 1989, that Kenyan-Zimbabwean proposals might break the negotiations deadlock. Mozambique: MNR representative interviewed on Lisbon radio, comments on Chissano’s speech. 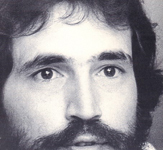 Manuel Frank is interviewed on Radiodifusão Portuguesa on 10 January 1990, reported in the Summary of World Broadcasts [London]. In English translation. Click here to download a PDF file, size 200 kb. MNR no to Maputo peace offer. Chronicle [Bulawayo] (11 January 1990). In English. Click here to download a PDF file, size 31 kb. Mozambique: death of a mediator from Zaire. Indian Ocean Newsletter [Paris] (13 January 1990). In English. Click here to download a PDF file, size 34 kb. Recycles a report from an anti-Mobutu source claiming that mediator Boketshu Anzolo was killed in a road accident, probably in Mozambique. Apelo ao movimento anti-apartheid na África do Sul. Domingo [Maputo] (14 January 1990), p.4. In Portuguese. Click here to download a PDF file, size 88 kb. Appeal to the anti-apartheid movement inside South Africa Sunday Star [Johannesburg] (14 January 1990). In English. Click here to download a PDF file, size 98 kb. Carta aberta ao presidente Frederick de Klerk. Domingo [Maputo] (14 January 1990). In Portuguese. Click here to download a PDF file, size 537 kb. Eis os subscritores. Domingo [Maputo] (14 January 1990). In Portuguese. Click here to download a PDF file, size 492 kb. Lists the current signatories, and adds that Mozambican citizens can add their names to the list, with instructions on how to do so in Beira. Open letter to President Frederik de Klerk. Sunday Star [Johannesburg] (14 January 1990). In English. Click here to download a PDF file, size 117 kb. The text of the open letter. Kitt Katzin. De Klerk is urged to stop aiding Renamo. Sunday Star [Johannesburg] (14 January 1990). In English. Click here to download a PDF file, size 100 kb. Dries van Heerden. Maputo VIPs ask FW to help end war. Sunday Times [Johannesburg] (14 January 1990). In English. Click here to download a PDF file, size 103 kb. Escritores e académicos endereçam carta aberta ao Presidente de Klerk. Notícias [Maputo] (15 January 1990). In Portuguese. Click here to download a PDF file, size 492 kb. Peace process unblocked. Africa Research Bulletin [Political, Social, and Cultural Series] [Exeter] vol.26 no.12 (15 January 1990), p.9529. In English. Click here to download a PDF file, size 124 kb. A summary of events in December 1989, taken from various newspaper sources, including the Economist [London]. [Untitled news item]. Africa Economic Digest [London] (15 January 1990). In English. Click here to download a PDF file, size 18 kb. Manuel Frank, the MNR’s Lisbon spokesperson, tells Reuters on 4 January that direct talks might begin as early as February, possibly in Nairobi. A carta e o carteiro. Informáfrica [Lisbon] no.11 (20 January 1990). In Portuguese. Click here to download a PDF file, size 29 kb. Identifies Jean-Yves Olivier, a French businessman and a personal friend of Jonas Savimbi, as a possible interlocutor between Chissano and Dhlakama. Moçambique: sim, mas. Informáfrica [Lisbon] (20 January 1990). In Portuguese. Click here to download a PDF file, size 82 kb. Eddie Koch. A crucial month for Maputo, in which far-reaching decisions are made: in the beginning, there was the dark. Weekly Mail [Johannesburg] (26 January 1990-1 February 1990), p.12-13. In English. Click here to download a PDF file, size 174 kb. Eddie Koch. If peace is signed, will Renamo actually cease fire? Weekly Mail [Johannesburg] (26 January 1990-1 February 1990), p.13. In English. Click here to download a PDF file, size 572 kb. Eddie Koch. The poet of Maputo calls on FW to end the war. Weekly Mail [Johannesburg] (26 January 1990-1 February 1990), p.12. In English. Click here to download a PDF file, size 71 kb. Above: The two letters were also signed by such national figuras as (from left to right) the world-famous artist Malagatana (1936-2011), the much-translated novelist Mia Couto (b.1955), the exiled poet Noémia de Sousa (1926-2003) and the pioneering photographer Ricardo Rangel (1924-2009). Mozambique: new proposal from Kenya and Zimbabwe. Indian Ocean Newsletter [Paris] (27 January 1990), p.4. In English. Click here to download a PDF file, size 44 kb. Correctly states that ‘speculation is rife’ regarding the state of negotiations, while summarising proposals from Daniel arap Moi and Robert Mugabe. Mozambique professionals address de Klerk. Southscan [London] (29 January 1990). In English. Click here to download a PDF file, size 14 kb. EUA optimistas na paz na RPM. Notícias [Maputo] (30 January 1990). In Portuguese. Click here to download a PDF file, size 478 kb.